1. It isn’t new; it’s from 2007. 2. It was published in the Harvard Journal of Law & Public Policy, which is the official journal of the Federalist Society (and so, despite the Harvard name, has a more right-libertarian bent than one might expect; in fact, the top of the Journal’s homepage bears the legend “The nation’s leading forum for conservative and libertarian legal scholarship.”). Now, I haven’t read the article itself or looked at the sources or methodology. I am in favor of its conclusion (as should be obvious from this blog). Its truth or falsity should be determined irrespective of its source. Breitbart.com‘s calling it a Harvard study is bending the truth nearly to the breaking point, and Hot Air‘s assertion that because this article is from HARVARD! !11!1 it settles everything is flat out wrong. I was originally going to submit this as a comment over at Alphecca, but decided instead to get in my one post for August (I have no idea why this has become my new schedule, but I will try to post more frequently). *If you remember, gentle reader, I am currently a member of the law review at my law school. Reviews are predominantly student-run, and we spend most of our time running down sources and editing submitted pieces. I got the bulk of my gloating in by quoting Conan the Barbarian, but I couldn’t let Bloomberg’s and Giffords’s post-gun-control-failure statements just sit there. Bloomberg, of course, founded and bankrolls Mayors Against Illegal Guns, a notorious anti-gun organization filled with criminal mayors. Giffords similarly started her own super-PAC to push for strict gun control. I’m not saying that Bloomberg and Giffords aren’t free to spend their money (or in the case of Giffords, donor money) to lobby for policy changes they support. Free speech and the right to petition legislators and the government for the redress of grievances are at the heart of our political system. That said, it’s disingenuous at best, and damnably hypocritical at worst, to bemoan the grip that other special interests have on Washington merely because they defeated your special interests. *For a complete list of the various fallacies Giffords employs in her blatant attempt at emotional blackmail, check out James Taranto’s response at the Wall Street Journal. See them driven before you. And hear the lamentations of the women. Thanks to all who called their congressmen to read them the riot act. Of course, just because gun control was defeated today doesn’t mean that it’s gone forever. The price of freedom is eternal vigilance, etc. This bill is like trying to plug the holes in Swiss Cheese by cutting out plugs from the same slice and inserting them into the holes that are already there. I’ve only read excerpts of the bill so far, but I’m not impressed. I’ll try to read it this weekend and post my thoughts in between preparing for my trial advocacy final and grading legal research assignments for class I’m the TA for. At least in the Fourth Circuit. The Fourth Circuit Court of Appeals’ decision reversed the district court’s decision in Woollard v. Sheridan (which had invalidated the Maryland concealed carry statute’s requirement that an applicant show good cause for issuance of a concealed carry license). The court even notes that these findings (adopted in 2002), have not been substantially changed since the Maryland legislature first adopted them in 1972. Somehow, despite the passage of 30 years from the legislature’s initial adoption to its re-adoption of these findings, the situation in Maryland has not changed (after all, if it had worked, and crime had gone down in response to any laws based on these findings, surely the present findings would differ by at least crediting the current harsh laws for the drop in crime). This is in fact strikingly similar to the Supreme Court’s current case on the Voting Rights Act, in which Congress had adopted the same “findings” today as it did at the VRA’s inception–in 1965. The Fourth Circuit went on to list several other “findings” (I won’t reproduce them here; if you click through to the Volokh Conspiracy and then to the opinion itself, you can read them on pp. 26-28). This reads like a litany of standard gun control fears–essentially that liberalized carry will take us back to the wild west. It hasn’t (for example, despite similar claims by opponents of Virginia’s bar and restaurant carry bill, crime didn’t increase–it dropped). Maryland essentially argued that they should be able to deny carry licenses to the vast majority of applicants because of public safety, and the Fourth Circuit went along with it (citing heavily to the Second Circuit’s opinion in Kachalsky, but doing its best to minimize the Seventh Circuit’s opinion in Moore). I would go further, though. The various circuits, in Kachalsky, Peterson, and now in Woollard are focusing too much on Heller and McDonald‘s language regarding the “core” Second Amendment right. The right of armed self-defense may be strongest in the home, but as the Seventh Circuit noted in Moore, that does not mean that it is nonexistent elsewhere. I only have one other thing to say about this case–I’m very glad it came out today and not last Thursday, or I would have had to stay up all night reworking certain parts of my law review note so I could turn it in on Friday. Robert VerBruggen over at NRO highlights a major problem with New York’s new seven-round magazine limit: chiefly that most modern handguns don’t have seven-round magazines. Increased magazine capacity confers an advantage when one is limited by magazine quantity. If one wears gear making it feasible to carry a large number of magazines (as the Aurora shooter did), then the capacity of those magazines does not confer so great an advantage. In other words, if you’re ammunition-limited, magazine capacity doesn’t matter. If you’re magazine-limited, magazine capacity does matter. Mass shooters have generally been the former, and the law abiding the latter. I don’t carry because I want to shoot someone, just like I don’t have a first aid kit in my car because I want to practice emergency medicine. I carry (when I can) because should I need immediate protection, the government has no obligation to provide it. Historically, selective enforcement is recognized as a sign of tyranny, and an abuse of power, because it violates rule of law, allowing men to apply justice only when they choose. Aside from this being inherently unjust, it almost inevitably must lead to favoritism and extortion, with those empowered to choose being able to help their friends, take bribes, and threaten those from they desire favors. Of course, if you’re not David Gregory, and don’t have David Gregory’s connections, the D.C. attorney general is not nearly so understanding. Tens–likely hundreds–of millions of such magazines are lawfully possessed in the United States by law-abiding gun owners. More than 1 million PMAGs are backordered from Magpul. Brownells sold through three-and-a-half years worth of magazines in three days. 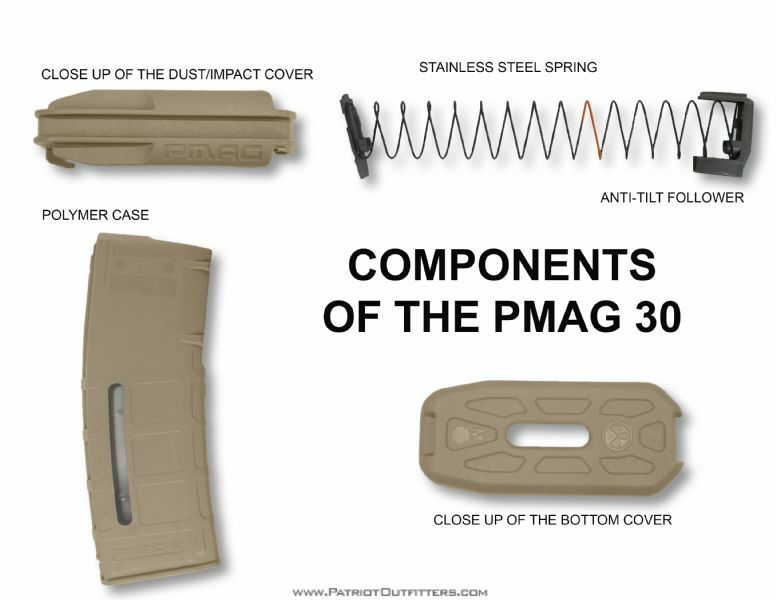 Magazines like the one Gregory displayed on Meet the Press, and Magpul’s PMAG, are not complicated; they are made up of a box and a spring. Given the sheer number of standard capacity magazines in the United States, and the infrequency of mass shootings (they are not becoming more common, and your chances of being killed in a mass shooting are about the same as your chances of being struck by lightning), these magazines, as well as the AR-15 rifle (and all semi-automatic weapons) are in common use for lawful purposes. If in common use is to mean anything at all, it must cover the AR-15–America’s most popular rifle–and standard capacity magazines. Those of you who are good at math will note that that is closer to the 1791 ratification of the Second Amendment than to today (~90 years vs. ~130 years). Certainly far closer to the framing than TV, or the internet, but about on par with radio. Proposing that somehow the arms protected by the Second Amendment are only those in existence at its framing and ratification is the first step down a dangerous road. If that logic applies to the Second Amendment, there’s no reason it couldn’t apply to any of the others. Twitter? Facebook? The entire internet? TV? Movies? Video games? Not protected under the First Amendment because at its framing and ratification you had to own a printing press and print pamphlets or stand on a soapbox and shout at passers-by to be heard. Email? Cars? Your computer? Cloud storage? All searchable without a warrant, probable cause, or even reasonableness, because the framers did not have any of that technology. If you don’t like the Second Amendment, you’re welcome to try to repeal it, but consider: Would repealing the First Amendment mean that we no longer have the freedom of speech, or the press, or religion? Rights are not conferred by the government–they are, in the words of the Framers, unalienable. Self-defense is a human right, and the best, effective means of self-defense is a firearm. A firearm puts the weak, the infirm, and the small on equal footing with their attacker. To abrogate that right in the face of media-driven hysteria would be wrong, particularly when that hysteria is based on several false assumptions: (1) Mass shootings are not becoming more common, (2) An assault weapons ban would not have stopped the CT shooter, (3) Anything that would have prevented the CT shooting would have serious constitutional problems, and (4) America has already had a conversation about guns, and the gun control side lost. I understand the drive to do something, but gun control proponents are focused more on doing anything, whether it would work or not, and whether it would be constitutional or not. *Including, among others, the NY Post, which somehow fails to note (probably because of the pearl-clutching) that the AR-15 was invented in the late 1950s. The NYT notes that the AR-15 is the most popular rifle in America (and yet disingenuously posts a picture of a rifle that would be illegal under CT law, instead of one that was legal, like the shooter actually used). In Heller, the Supreme Court held that the Second Amendment protects arms in “common use.” (554 U.S. at 627) The most popular rifle in America surely falls under this “common use” umbrella. One the one hand, anti-gun wailing and gnashing of teeth is like music to my ears (the decision is here). Though gun control’s not quite dead, it’s definitely on life support. On the other hand, this has thrown a wrench into a certain project I’ve left undescribed (see fn 1). Between this case, the 2d Cir.’s holding in Kachalsky, and whatever the 9th Cir. holds in Richards v. Prieto (assuming it’s decided next semester-ish), I’m going to have to rework substantial sections. On the gripping hand, my project not only turned out to be timely, but by the time it’s done, it may even be on a circuit split! And with that said, those astute readers of mine will likely have deduced the general subject of my law review article. Now, back to studying. One more exam to go, and then this semester will be officially over.